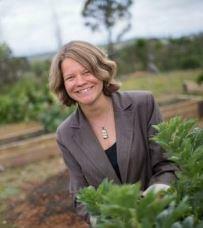 Kate Wright is a postdoctoral research fellow at the University of New England, Armidale. The focus of her research is the important role played by more-­than-human communities in working toward social and environmental justice, with a particular emphasis on decolonisation in Australia. Her current project is a collaboration with Armidale’s Aboriginal community to develop and maintain a community garden at the old East Armidale Aboriginal Reserve site as an activist platform for Aboriginal reclamation and cultural revival. This public environmental humanities research project experiments with novel multispecies assemblages and more-than-human methodologies to develop alternatives to neoliberal, colonial and anthropocentric modes of living and thinking. Kate recently published her first monograph, focused on decolonising philosophy and writing through intimate, embodied and situated encounters with the more-than-human world, titled Transdisciplinary Journeys in the Anthropocene: More-than-human Encounters in the Routledge Environmental Humanities Series (2017). Kate holds a PhD from Macquarie University that received the Vice Chancellors Commendation for Excellence in Research, and is co-editor of the Living Lexicon section of the Environmental Humanities journal. Before commencing her full time research role, Kate tutored, lectured and convened units across a range of disciplines in the Arts and Science faculties at Macquarie University (2009 - 2013) including environmental humanities, cultural studies, human geography, media and science communication. Environmental Humanities; Environmental Philosophy; Cultural Studies; Multispecies Ethnography. Wright, K. (2017) Transdisciplinary Journeys in the Anthropocene: More than Human Encounters. Routledge, Environmental Humanities Series: London. Wright, K. (Under Review) ‘Gleaning the Soils of Silver City’, Australian Humanities Review. Wright, K. (2012) ‘An “Upside-Down land”: Contested Rock Formations in the New England Landscape (Australia)’ the Permanent European Conference for the Study of Rural Landscapes Conference Proceedings pp. 172 – 183. Wright, K. (2009) ‘Manicured Nature: Nativism, Authenticity and Belonging in the Armidale State Forest (NSW)’ in Julie Lunn (ed.) Proceedings of Curtin University ‘Creative Margins’ Conference, 2009. Wright, K. (2010) Review of ‘Creative Nation: Australian Cinema and Cultural Studies’ (Edited by Amit and Reema Sarwal), Media International Australia, 134.